The game started with limited action in the first quarter, it seemed the two teams were getting a feel for one another. Atlanta put the only points on the board with a 26 yard field goal, which was set up by a beautiful 21-yard diving grab across the middle by Taylor Gabriel. Los Angeles would answer with a quick strike, on a 52-yard touchdown run by Todd Gurley. His blockers opened up a huge hole on the right side and he won a foot race down the sideline. On the next possession, Matt Ryan would hook up with Julio Jones for gains of 30 and 17, before Matt Bryant added another field goal, this time from 45 yards out. Atlanta cuts the lead to 7-6, with just under six minutes to play in the half. After Desmond Trufant picked off a terrible Jared Goff pass, Atlanta set themselves up to take the lead with just under a minute to go. However, the attempt by Matt Bryant was blocked and returned by Lamarcus Joyner to the 1-yard line. One play later, Todd Gurley had his second rushing touchdown, giving the Rams a 14-6 lead, which would be the score at half. We saw a pair of punts to start the second half, but Atlanta put together their best drive of the game on their second possession of the half. An 11 play, 82 yard drive was ended on third and 10 when Matt Ryan hooked up with Mohamed Sanu for a 16 yard touchdown, making it a 14-13 game. With momentum on their side, the Falcons picked off Goff for a second time, setting up the offense with great field position at the Rams 32. 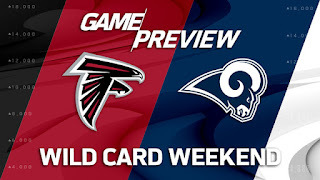 The Rams defense was up to the task, as Connor Barwin was able to sack Matt Ryan on a third down, nearly taking the Falcons out of field goal range. However, Matt Bryant knocked through his third field goal, this time from 52 yards out. Atlanta now leads 16-14. Los Angeles was able to answer with a beautiful drive, marching 75 yards in 10 plays. Goff connected with Robert Woods for the first time, good for 30 yards. They would cap it off with a 6-yard strike to Woods in the end zone. The Rams go back on top 21-16, with 10 minutes remaining in the game. Just three plays into the Falcons drive, Matt Ryan throws a pass to Justin Hardy that tips off his fingers and is picked off by Nickell Robey-Coleman and is returned to the Falcons 19. With Gurley set out wide, Tavon Austin hauled in a 7 yard TD pass over the middle from Goff, as the Rams saw their lead increase, 28-16. On a 4th and 17, Matt Ryan hit Julio Jones with a pass over the middle, but was only able to pick up 14 yards, turning the ball over on downs with under four minutes to play. After forcing a punt, Atlanta would get the ball back at their own 6 yard line with 1:47 to play. Just as it looked like the Falcons were about to score, Sanu fumbled at the 8 yard line, after a 46 yard catch and run. The Rams recovered and ran out the clock, beating the Falcons 28-16.